I begin Soul Writing workshops by asking people why they have joined and what they hope to achieve. The reasons are always different, but there are similarities. Beginners want to give voice to an urge to write, or to find out if they can write. My answer to them is that everyone can write story and poetry if we have language. Professional writers sometimes come with ‘writers’ block’ – or, as was the case with a recent novelist (who has written over twenty books) who joined the UK Summer workshop and wanted to reconnect with her intuitive voice, rather than writing in a prescriptive fashion to the order of her publishers. My answer to all of these beliefs is the same: “We are all naturally creative. All we need to do is switch off the voice that tells us we cannot and tune into the natural ability we all have to write beautiful, powerful stories.” Soul Writing exercises and techniques are designed to do exactly this – and I am very much looking forward to sharing the tools and processes with guests on the Museflower Soul Bliss Retreat in October. The Soul Bliss retreat has been especially tailored to penetrate deep into your consciousness and open up your creativity to allow your soul to speak. We will learn to trust the inner voice we all have and listen to what it wants to express with meditation and creative writing techniques you can use again and again. Learn them once and these tools are yours for life. 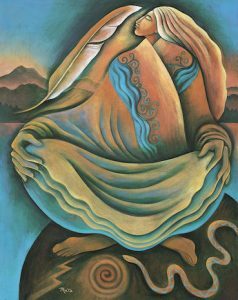 The other fear that some people have is that they will not be able to meditate. Prior meditation experience is not required. I will guide everyone into meditation. It really is very simple and easy to do when you are shown how. It’s also very fulfilling and fun! If you would like to try meditation before you join us, below is a breathing exercise that is a good preparation for the mind. It’s simple and easy. Soul Writing exercises always begin with a basic breathing exercise to bring us into stillness. Spend 10 minutes each day in a quiet place, breathe slowly and listen to the sound of your breath as it moves in and out of your lungs. Your only purpose is to listen to the breath and slow your breath to a comfortable pace. It is natural that thoughts will come. Do not evaluate them; just bring the focus back to the breath, slowing it down gradually. You can simply rest in this state of stillness. Or you can add some simple visualization to the breath. When the breath is slow and rhythmic and you have a sense of calm and peace, imagine a white light in the center of your chest, at your heart center. Know that you are this light, focus all your senses on the light and as you breathe in and out allow the light to glow brighter like a bright star at the center of your chest. This is your creative light, the center of your being, continue to breathe, continue to allow it to grow. It is the light of infinite possibility. Sit in this state of infinite possibility inhaling and exhaling the beautiful white light; nothing else, just the breath and the light. This is a good exercise to prepare you for the Soul Writing exercises, but don’t worry if you don’t have time or if you can’t focus for long. As I said, no meditation experience is needed. I’m really looking forward to exploring your soul stories with you in October in Thailand (11-16 October). Museflower Retreat & Spa is the ideal peaceful lush green setting to support the inner world to open and express itself. 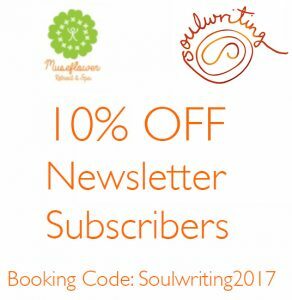 Please contact sarah@soulwriting.co for more information about Soul Writing and the Museflower Retreat and Spa.